I am going to look at a C26 tonight. What should I look for when inspecting this boat. Please share your thoughts. looking to get back into sailing. Here is the link to the craigslist add. definitely offer less if only fair cond and no motor. You are going to need to transport it so the trailer would also bring the price down. Trailer and boat complete, no motor.... I like it for $2000 but if you can get a better deal by all means do so. Remember in the end the fair market price is what the seller is willing to sell for and what the buyer is willing to pay. Nothing more nothing less. Keeping my fingers crossed that you have a new boat come morning. Welcome to our Forum, some things are made every day. 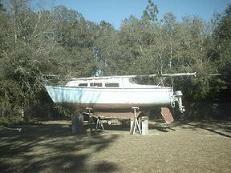 But 1979 Chrysler sail boats in that good of shape are hard to find. Here's my concerns after being shown the boat. Floor has cracks and indeed made a cracking sound at least once when I took a step. Should that be a major concern? Exterior teak wood is in very bad condition and would need to be replaced. Is that easily done? Trailer is OK. Jack stand doesn't work and the tongue extension is rusted in place, needs tires and owner will take care of that if purchased. Steve... a C26 with trailer will make any of our hearts skip a beat. I was very much in your shoes back in the day. 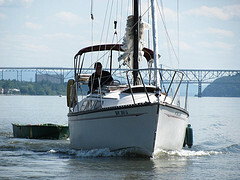 Often older sailboats are like icebergs problems are out of sight. If this is all new to your as it was for me I really didn't at first know what I was looking at. Offer him $1000 and then work back up to $1500 if need be. I'm not saying to drop it and if your heart is in it go for it, but restoring a good old Chrysler is not a cheap undertaking in time or money. 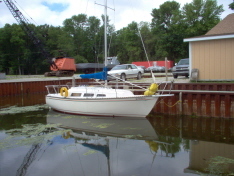 My C26 will sail, but not as soon as I would like it too. At the moment I'm doing what at least for me I should nave done first... start out smaller. There will still be a bit of work to do, but not nearly as much. Welcome to the form... the rant above is just my two cents worth. I have one like it, if I did not I would be up for a road tripe to buy it. 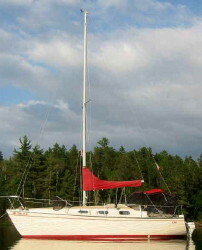 I would pay the $2000 if you think that is too much money to spend for a sail boat that you will learn to love. Sale the trailer for $2000 an have a free boat. Sorry, I can't help talk you out of buying a boat, it would be hypocritical. You guys let me down, bought the boat. Wrote the check today. Pick it up when the owner gets it cleaned up and air in the tires. Now for the barrage of question that I need answered. 40 Horse motor to big for this boat. I need a motor. Teak wood topside trim needs replaced. any advice on doing this? Big crack on top of the square fiberglass where the mast mounts, . Ugly looking but was told it was a non factor and he was going to patch fix. More ? to come for certain. All right ! Ask away with the questions. These boats tend to have similiar problems that crop up on them all - the mast step area you mentioned is one of them. As is the creaky sole in the cabin..some of those fixes are on Emergency Exit's page at the link below my posts. I've worked on 2 of them and found the same things on both. Darn! The posting has been deleted, I cant see the boat. You will need to post new pics. The fact that we have another C-26 owner on the forum is great. We seem to be the minority. 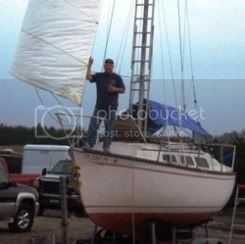 Welcome Aboard Whabadoo, First thing to do is get it in the water an go sailing. Look for an old 2 stroke 6 hp to 15 hp Elec. start, extra long shaft. From were outboard sits on mount to center of prop 25 inches. GO Sailing, Go Sailing, Go Sailing, That is what the boat was made for, have fun with it. I'm on a roll, no stopping me now. If its a Chrysler outboard, then there's no better source than Franz Buddenburg at www. Franzmarine.com. If there's a Chrysler outboard guru anywhere, well then whoever he is he asks Franz for advice. Last time I asked he had a couple Sailor 280's for around $1200. I have a extra remote shift control for a Chrysler Sailor 10 HP an have the outboard also. Not shore what you got ( web site no longer working ) I got the outboard an controls from sailbod2, motor had just been repaired now water pump an head gasket pugs an points. $350.00 for all. Here are a couple of pics of the motor out of my brother-in-laws Volvo trunk. Not sure what I have or don't have here. I have owned a number of outboards in the past, but no two strokers. Need a gas tank, any recommendations? Looks like its the 10hp that is correct for this boat. "Sailor 250" right ? Cool, that's the right one, or one of them. 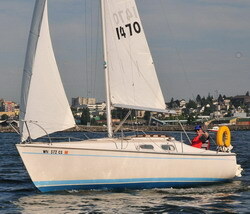 The Sailor 280 is the 12HP version. By transmission control he could have meant anything from the cable to the actuator arm on the shift lever in the motor, etc. I'd either by a shop manual for it, if inclined to do the work myself, or take it to a local shop if not. After sitting up you'll want to change the water pump impeller for sure. Well, The only guy around who will work on that motor is booked out solid for a month, wouldn't even take my name. Guess I'll be gett'n a manual. Whabadoo wrote: Well, The only guy around who will work on that motor is booked out solid for a month, wouldn't even take my name. Bad time of year I guess, everybody thawing out the boats all at once. My preferred method is to do at least 'try' to do the work myself. Even if it turns out to be over your level and you still take it to the shop you know something about the motor, and how to fix minor glitches. Franz has the true 'shop manuals'. Clymers and others sell repair manuals but they can be a bit vague if they cover many models in one volume. You did good, youtube has step by step on how to get it running. But gas tank in first, then put the gas in. An go sailing, you can do it an we are hear to help. I have the shop manuals, an youtube has the videos on how to get it done.